The draw will take place on 19 December 2010 in Herning (DEN). A little less than one year remains before the final tournament of the 2011 Women’s World Championship takes place between 3 and 18 December 2011 in Brazil. From these 11 places, three are reserved for the best three teams at the EHF EURO 2010 in Denmark and Norway. The remaining European places at the final tournament – altogether 8 – will be decided via Play-Off Europe with a knock-out in a home and an away game. The draw for 2011 Women’s World Championship, Play-off Europe will take place on 19 December 2010 at 12:30 hrs at the occasion of the EHF EURO 2010 Championship Press Conference in MCH Arena, Herning (DEN). 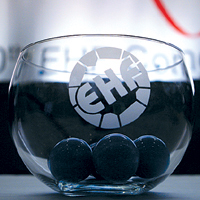 12 of the 16 participating teams of EHF EURO 2010 are qualified for the play-off matches. This includes the team that will be ranked fourth plus CRO, ESP, FRA, GER, HUN, ISL, MNE, NED, SLO, SRB, UKR. Two pots with eight teams each will be prepared. Pot 1 contains the eight best ranked teams of the EHF EURO 2010 which are not directly qualified for the final tournament. Pot 2 contains the teams ranked 13 to 16 of the EHF EURO 2010 and the four winners of the 2011 World Championship Qualification Europe groups. One team of Pot 1 is drawn against one team of Pot 2. For each fixture the home and away right will be drawn. The first leg matches are scheduled for 4/5 June 2011 and the second leg matches are scheduled for 11/12 June 2011. The winners of the play-off matches will qualify for the 2011 Women’s World Championship in Brazil (IHF event) from 3 to 18 December 2011. Find all information on the draw here.